Valentine’s Day is Wednesday, and while Maine does not grow cocoa beans, you can still give your sweetie local chocolate treats. 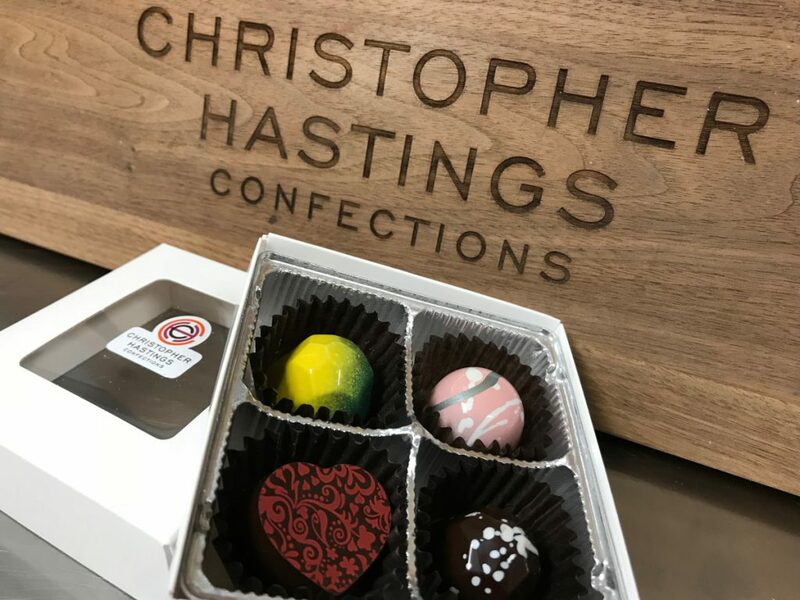 The men behind Christopher Hastings Confections have taken local candy to the next level with their glossy, colorful, hand-painted chocolates filled with Maine ingredients. The Waterville chocolatier’s tarted-up Needham (a classic Maine candy if there ever was one), part of their Taste of Maine assortment, has none of the mouth-puckering sweetness of the Needhams your grandma made. Christopher Hastings uses less confectioners’ sugar and more Maine russet potatoes, as well as unsweetened organic coconut flakes, and vanilla bean paste rather than extract. The result is a glossy, beautiful Needham that brings out the flavor of the Maine potato and is still sweet but not too sweet. For the company’s Maine Beer Nut–Maple confection, organic walnuts are candied in Maine-brewed Bigelow beer, then incorporated into a fondant made with local maple syrup. The Maine sea salt caramel is made with Eggemoggin Reach sea salt from Deer Isle, “a large-flake sea salt that takes to the caramel well,” says Nate Towne, who owns the company with his husband, Mark Simpson. Ours came in a light blue bonbon, and the caramel dripped onto our fingers as we ate it. You can also get these made with whiskey from Maine Craft Distilling in Portland. “We feel very strongly about supporting our local food economy,” Towne said. Local honey goes into the Maine Honey Ginger Nougat, and it replaces the corn syrup in the company’s marshmallows; a Valentine’s Day version contains a touch of rosewater from the Sabbathday Lake Shakers. Christopher Hastings’ Moxie marshmallows are made with local gentian root, the same plant that gives the Maine-made soda its flavor. Other chocolates use good-quality locally stocked teas, and other locally manufactured spirits. Towne grew up in Waterville as a self-described “candy fanatic,” who collected bottles by the roadside to feed his gummy fish habit. Towne runs the business, while Simpson makes the chocolates when he’s not working as a photonic engineer in Boston. The couple sold their first chocolates in 2014 at a crafts fair in Belfast and have steadily grown the business, mostly through pop-up retail shops around the holidays and through their website. In May, they will double their work space and open their first retail shop, which will be in Waterville. You may have figured out by now that there is no Christopher Hastings. To name their company, Towne and Simpson combined their middle names. “It looked and sounded really elegant, and we fell in love with it,” Towne said. The Taste of Maine assortment ranges in cost from $4 for two pieces to $32 for 16 pieces, and can be ordered through chconfections.com. Come spring, look for a local rhubarb meringue truffle.